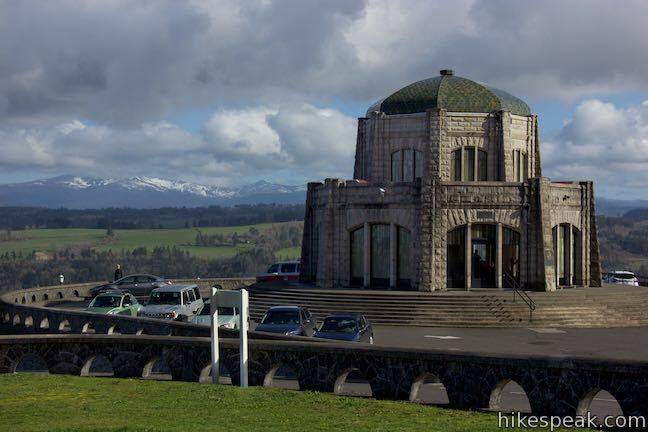 Vista House is a roadside viewpoint like no other. The beautifully designed and maintained building is an Oregon icon designated as a National Natural Landmark. The viewing deck that wraps around Vista House offers one of the greatest non-hike-dependent views in Oregon. Vista House resides on the inside of a bend in Historic Columbia River Highway on Crown Point, a lofty landing of basaltic rock at the west end of Columbia River Gorge. 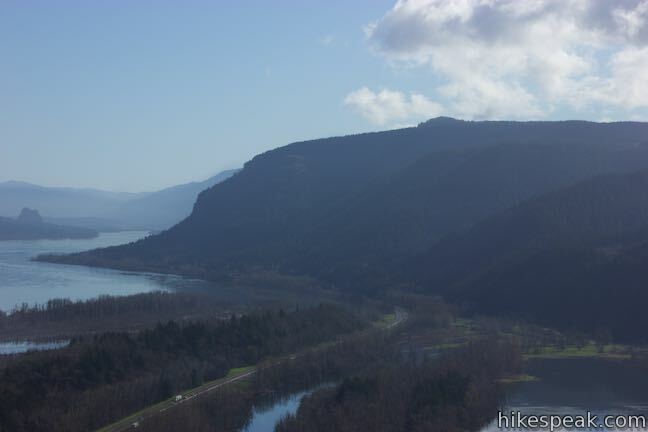 Crown Point serves as a gateway to Columbia River Gorge and if you reminisce on the point’s early name, Thor’s Heights, you’ll recognize the epic power of the views. From outside Vista House, and from the viewing deck that wraps around its second story, you’ll find a sweeping panorama. Look west toward the city of Portland, some 20 miles away. Look north across the river toward the state of Washington. Silver Star Mountain and Mount Adams rise to the northeast. 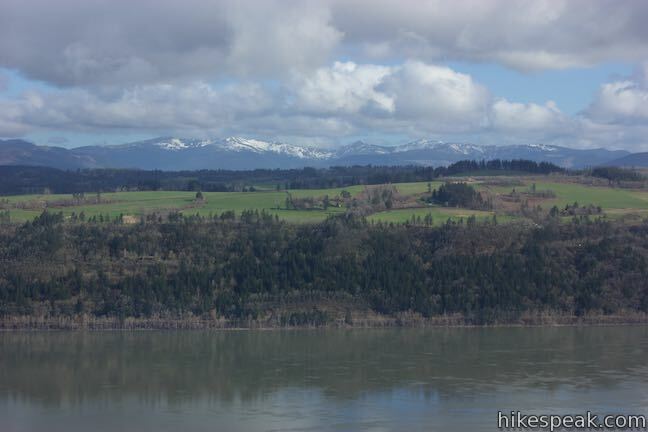 Look east up the Columbia River Gorge, where steep cliffs frame the wide river. If you’ve hiked to Angel’s Rest, you should be able to distinguish that natural landmark to the east. Step up the stone steps to enter the Vista House. Inside, walk across the marble floors to a desk where docents offer visitor information for the Vista House and Columbia River Gorge. In the basement, you can browse exhibits, peruse a gift shop, use the bathrooms, and enjoy hot drinks from the espresso bar. Head upstairs to walk around the viewing deck at the second story of Vista House and admire the surroundings. Vista House was constructed between 1916 and 1918 alongside the concurrently constructed Highway 30 (what is now called Historic Columbia River Highway). 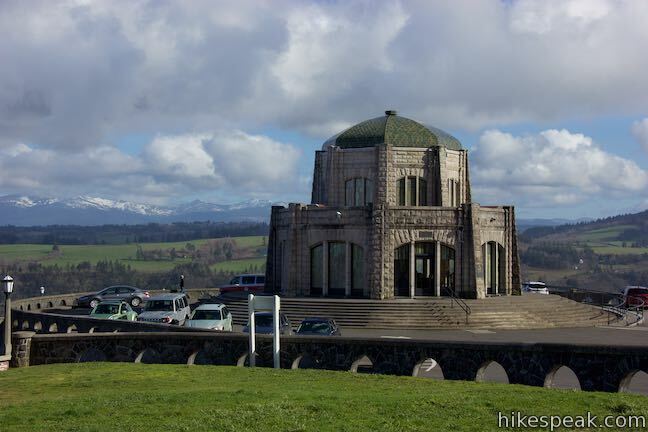 The interstate came later and the Vista House is now 4 miles from exit 22 of Interstate 84. 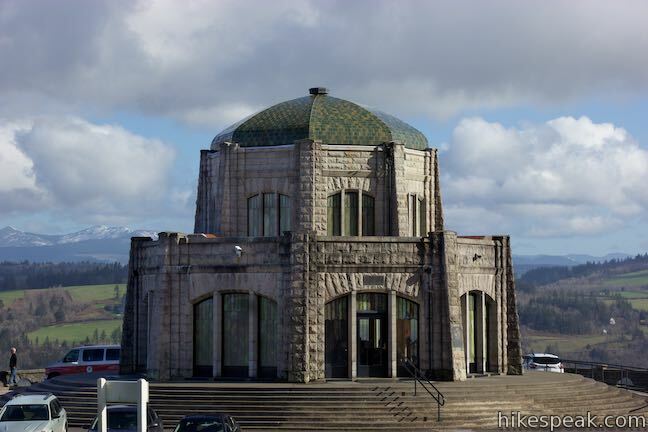 Architect Edward M. Lazarus designed the Vista House to be “a temple to the natural beauty of the Gorge,” constructing a round structure with 55-foot tall walls of gray sandstone. The copper roof is made of glazed green tiles. 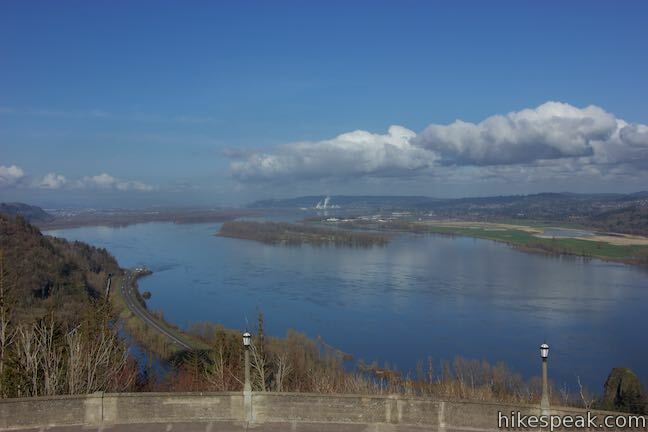 Highway 30 was engineered to be the “greatest highway in America” and the dedication ceremony took place at the site of the Vista House on Crown Point, about 700 feet above the Columbia River at the high point of the “wonderway” (highway). The reason this location was selected for the Vista House is obvious – panoramic views over Columbia River Gorge. Vista House is open daily from 9 a.m. to 4 p.m. (weather permitting). 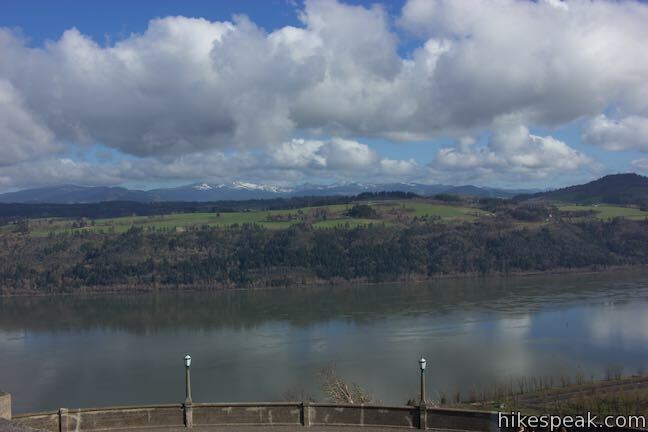 No fee is required to park along Historic Columbia River Highway or enter Vista House. Near the historic building you’ll find an open grassy area for picnicking or walking a dog. 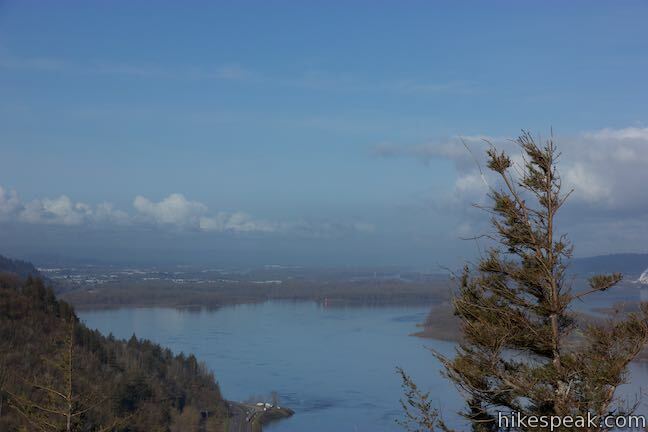 Leaving the Vista House, you can continue east on Historic Columbia River Highway to visit Latourell Falls, Angel’s Rest, Multnomah Falls, and more hikes in Columbia River Gorge. To learn more about the Vista House, contact Friends of Vista House by visiting vistahouse.com or calling 503-695-2230. 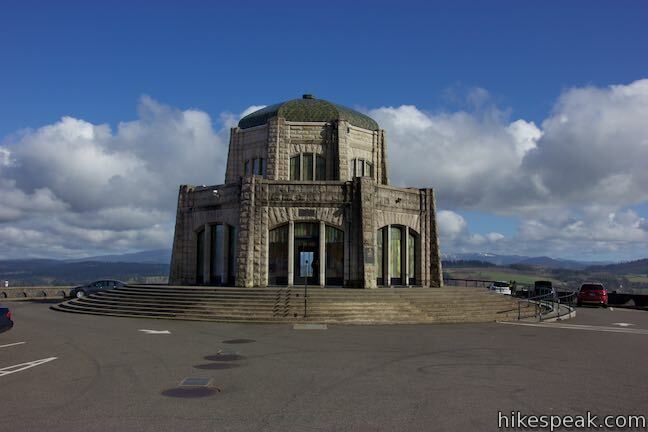 Friends of Vista House is a non-profit 501(c)(3) group that works with Oregon State Park to preserve this Vista House and share its history. They greet visitors, conduct tours, and operate the gift shop inside Vista House. To get to Vista House: Take interstate 84 to exit 22 for Corbett, which is 13 miles from the intersection of Interstate 205 and Interstate 84 in Northeast Portland (this exit is also available to westbound travelers). From the offramp, turn south on NE Corbett Hill Road. Take this road up the side of the gorge for 1.4 miles to a triangle-shaped intersection. 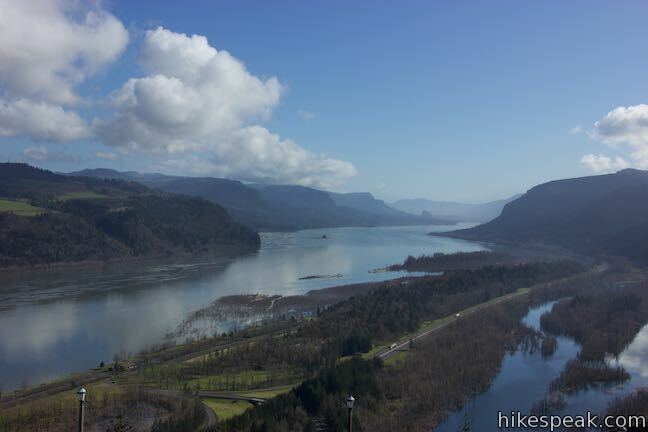 A pair of left turns will put you on Historic Columbia River Highway headed east. Follow this road for 2.7 miles to the Vista House, which is impossible to miss. Parking is available along both sides of Historic Columbia River Highway above the Vista House. These photos were taken in April of 2017. Click to enlarge. This 0.4 to 2.6-mile hike visits Oregon’s tallest (and probably most visited) waterfall, offering something to hikers of all abilities.